Last week I announced an exciting new project that I have been pouring my time, energy, money and resources into, The Mindful Mamas Club. It's an online membership site that will teach Moms across the globe how to use mindfulness tools and practices to enrich their lives. With a membership you also get access to a closed Facebook group where we will be diving into deeper themes and topics. Members get access to videos, guided meditations, mini pauses (1-5 minute mindful activities to do throughout the day to reset), breathing techniques and more. It's something I am so proud of and I hope to see you all there! I am a firm believer that if a person has an idea and isn't ready to receive it, bring it to life or run with it, the idea will be transferred to someone else. This is an idea that I could not risk slipping through my fingers as it is one that is pulling at every heartstring that I hold. But with starting a new business endeavor I am challenged with long hours, stress and the emotions surrounding the launch of this project. Up until now I feel like I have been "keeping my head in the game" so to speak. I wake up every single day and balance family life, building this business and maintaining the blog. I have had minor moments of panic and thoughts like, "What am I doing? Is anyone even going to want to join my membership site or is interested in learning mindfulness? Can I do this?" I think it's natural to have self-doubt and I am using a lot of the techniques that we teach in The Mindful Mamas Club to combat mom guilt, stay grounded and increase my positive self-talk. Well, because I am human and also very pregnant I got super overwhelmed mid-shoot and began crying. Winter grabbed a tissue and said, "Oh Mommy, your eyes are melting. I am here for you." This made me cry even harder because I am just so damn proud of the soul my daughter possesses. She really is a gem of a human and I love being her mother. I started crying mid shoot. I was just exhausted, emotional and needed a release. Winter grabbed a tissue and wiped my eyes. She is just so sweet. So after this epic release I sat down and noted some things that I can do to slow down, connect with this pregnancy and connect with myself. I am sharing them with you in case you need some ideas and to hold me accountable! Stretching: I always feel so much better when I can stretch. I recently downloaded the app called Down Dog Yoga and they have a restorative yoga section that is just wonderful. I also put on Yoga with Adrienne on YouTube. Before I go to my room for bed I stretch at least 10 minutes in the living room. I know my postpartum body will thank me for it later. Using Essential Oils: I plan to do an entire blog post about this because introducing essential oils into my life has been such a blessing. Every morning Winter and I pick out a combination to diffuse. It's become our morning pre-breakfast routine and she's already developing her favorites including citrus fresh, gentle baby and peppermint. At night I have started a whole routine that includes using Frankensence in my skincare routine and diffusing by my bedside 30 minutes before I go to sleep one of the following: lavender, stress away, peace and calming or gentle baby. Just this small change has already supported me so much. I also love rubbing some lavender on my feet before bed! I've noticed a considerable difference in the nights that I do this routine and when I don't. Pregnancy insomnia is real, people! If anyone is interested in info on how they can get started with oils please comment on this post! Reading: Every night I read for 30 minutes no matter what! I like to switch between entrepreneurial/self-help books (currently reading, Girl, Wash Your Face), fun mindless books (just finished Where'd You Go Bernadette) and mindfulness books (like Wherever You Go, There You Are). Affirmations: Before bed I tell my baby an affirmation while rubbing my tummy. I also say one for myself. I feel like this little bean and I are not spending as much focused time together as I did with Winter. With Winter I looked at my pregnancy app every single day, read to her and did a lot of visualization of what he or she might be and look like. 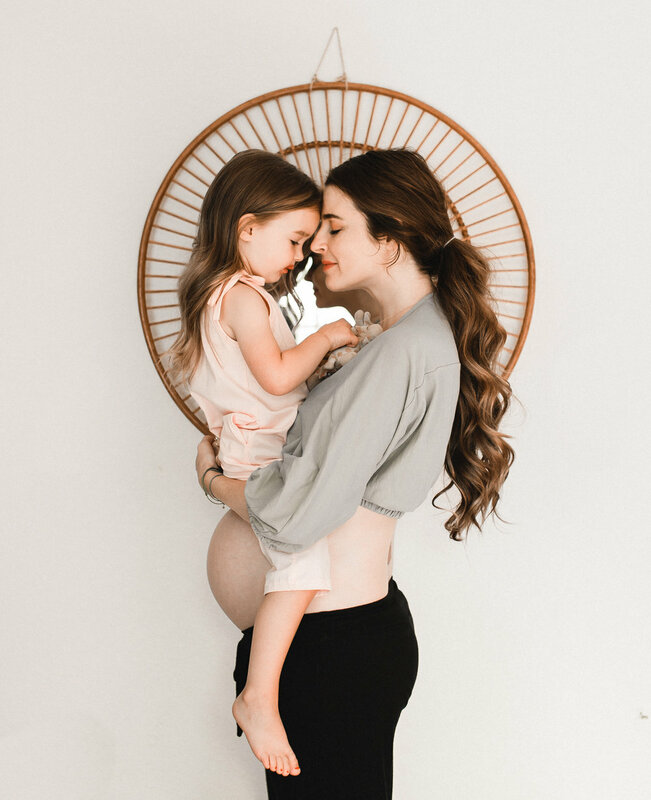 With this baby I totally have intimate moments, but they don't seem as purposeful or as frequent and I want to make sure I am intentional about this leading up to the birth. Time Blocking: I am guilty of switching between tasks like a mad woman. I feel like a ping-pong ball going from housework, to playing with Winter, to blogging, to The Mindful Mamas Club, answering texts and emails, etc. This task juggling made me feel unproductive and frazzled. I recently began time blocking and it's helped me stay on track and focused throughout my work day, so when it is family time, I can be much more present. Here's an excellent blog post that explains it. Winter got into my lipstick! She was so proud, I couldn't bare to wash it off. I hope sharing these changes that I had made can help you too. Please share with me anything that you do to pause and connect. Don't forget to check out The Mindful Mamas Club and follow us on Instagram too!